On Monday, May 5th, the Support House will kick-off our annual Sun S.M.A.R.T. 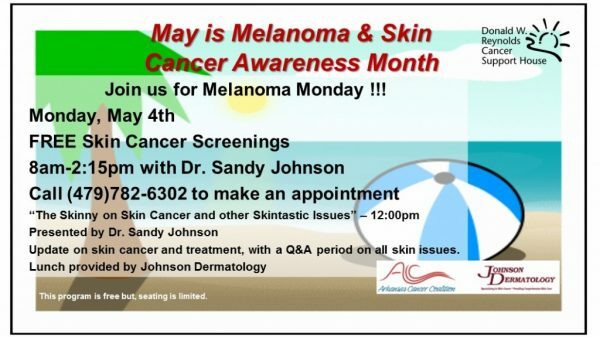 campaign with Free skin screenings and an education session “The Skinny on Skin Cancer and other Skintastic Issues” by Dr. Sandy Johnson. Each year, more than 68,000 Americans are diagnosed with melanoma, and another 48,000 are diagnosed with an early form of the disease that involves only the top layer of skin. Also, more than 2 million people are treated for basal cell or squamous cell skin cancer each year. Basal cell skin cancer is several times more common than squamous cell cancer. Learning about medical care for skin cancer can help you take an active part in making choices about your care. Tell you friends to be Sun S.M.A.R.T. To reduce the staggering number of melanoma diagnoses in Arkansas, Support House staff and volunteers will teach approximately 5,000 kids how to be Sun SMART this summer. Young readers will receive a Sun SMART card with a UV bracelet when they sign up for the Fort Smith Public Library’s summer reading program. Area kids will also hear the Sun SMART message at several community health fairs. Sunscreen will be provided free of charge at the Creekmore Park Pool.